Digital Ocean, the incredibly popular SSD-based cloud provider has finally made their block storage available to the public, paving the way for Digital Ocean to expand from compute based apps to larger storage based sites that scale. Currently it is only available in the NYC1 (New York 1) and SFO2 (San Francisco 2) datacenters - but they're working to make it avialable to the rest of the Digital Ocean network soon. For those who're unaware, "block storage" is the term given to storage on cloud providers that can be bought in blocks - often in 1GB increments - on top of your base plan. One of my only criticisms for Digital Ocean was the rather restrictive storage space they give to their servers. Personally I'm on the $20/month plan for my main server with very little need for the doubling of RAM and CPU of the $40 tier (CPU usage on my server rarely exceeds 10%). However, for a while now I've had issues with space with my personal site, for example, consuming quite a lot of space when I provide raw images in my portfolio. Similarly, a large data mining project that I'll be discussing in a future post had to be put on hold a few months ago because the database effectively consumed my entire droplet disk space. The new block storage option allows me to effectively double my storage capcity, adding another 40GB of storage, for only $4.00 extra per month. 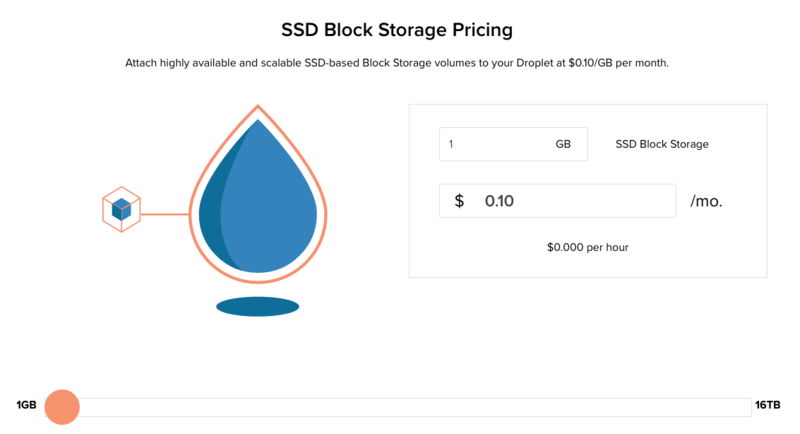 This storage is still the excellent SSD based storage offered on the main servers, but also lets you dynamically connect and disconnect any block storage volume from one droplet and attach to another. Again, just like the rest of the Digital Ocean service, the entire block storage system can be managed via the Digital Ocean API! Keep your eyes open for more block storage locations!